Lead generation is based on expanding your database with contacts, including people or companies, who are potentially interested in your products and services. We define a "lead" as a person or company that has shown interest in the offer of a brand and has shown that interest by leaving their data. The generation of leads is a key step in the process of inbound marketing, since it allows us to convert traffic to our channels into valuable contacts for the brand, which we can then direct along the conversion funnel until they become customers. The lead generation process begins by attracting visitors to the brand's website. Generally, this traffic will be directed to a landing page, which will be used to generate new contacts. A very common strategy is to offer the user a valuable content, such as a free ebook, a product test or a webinar, in exchange for their contact information. In turn, this landing page will be optimized to encourage conversions. It will usually include a brief description of the benefits of the offered content, focusing on what it can bring to the user. After filling out a form with their data and pressing the "Send" button or similar, the user will be incorporated into the database, will be sent or offered to download the content in question and a thank you page will be shown. Each user who has left their information will become part of the brand's database and will become a lead. However, not all leads have the same value, and not all are immediately converted into a customer. This is where lead scoring and lead nurturing strategies come into play. Lead scoring is a marketing technique that involves assigning a score to each lead identifying which lead is most likely to become a customer. In this way, you can focus on those that have the best chance of converting. Cold Lead. This person has left us his data, but it is still far from the moment of conversion, that is, that he is in the TOFU or "top of the funnel" phase. Marketing qualified lead (MQL). This person has already shown interest in the brand on several occasions allowing us to obtain more information about them. The lead is therefore in the MOFU or "middle of the funnel" phase. Sales qualified lead (SQL). This person has already gone through all the previous qualification phases and is ready to receive a phone call, a visit or a demonstration from the sales team. This lead is in the BOFU phase or "bottom of the funnel". Lead nurturing is the process of preparing and accompany lead along the life cycle, providing a series of contents, and custom actions depending on the stage where they are and their interests. Marketing automation can facilitate this whole process. Email marketing. E-mail can be suitable both for capturing users for the first time and for maintaining contact with them with lead nurturing actions. Segmentation is essential for this tool to be successful. SEM. Search engine ads (such as Google Ads) are a very suitable channel for generating leads, since they allow us to orient our actions according to the terms searched by users. The normal thing is to create groups of related search terms, with ads and landing pages that match what users are looking for at a certain time. Display campaigns. Although banners have a repution to be intrusive, if they are used intelligently, they can be a good way to capture the attention of the target audience and encourage them to leave their data. Advertising on social networks. Some social media platforms, such as Facebook, even have ads specially designed to capture leads without the need for users to leave the social network. It is also possible to use social networks in an organic manner to generate quality traffic to our website. Content marketing. Brand contents (for example, articles in a blog) are a good place to introduce lead generation campaigns, for example, presenting a report that the user can download for free in exchange for leaving us their data. Video marketing. Thanks to the possibility of embedding banners within a video, we can incorporate lead generation into our audiovisual content. Produce quality content. Content has a double function in your lead generation strategy: on the one hand, it helps us to attract quality traffic to our website or blog, and on the other, it serves to attract users and convince them to leave their data in exchange for ebooks, guides, reports and other downloadable content. Analyze your distribution strategy. It is not only necessary to produce quality content, but also to ensure that it reaches your users. Think about how you can use tools such as SEO and SEM to multiply quality traffic. Optimize your data forms. User contact or sign up forms are the means through which a visitor becomes lead, so they are a critical point of contact. Make sure they are adapted to different devices, try to have as few fields as possible and try different calls to action. Do not be afraid to experiment. Speaking of testing, do not hesitate to do A/B tests of different aspects of your lead generation campaigns: search engine ads, form design, landing pages ... Only then can you know what works best with your target audience. Track your results. In any marketing strategy, results measurement is essential. Devote the necessary time to establish your key metrics or KPIs (for example: total leads, qualified leads, visitors per lead ...) and establish regular controls to see how they are evolving and how you could improve. We hope that this information has helped you to better understand how the lead generation process works and how to use inbound marketing strategies to convert web traffic into customers. 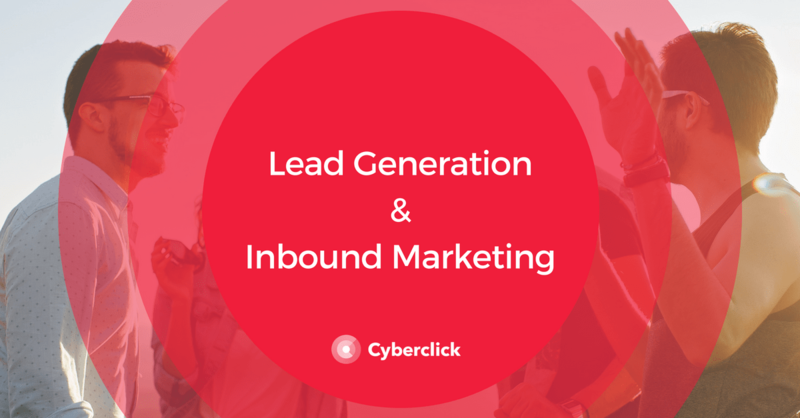 If you want to launch your own lead generation campaigns or optimize your company's recruitment processes, at Cyberclick we have a lot to offer you. We will be happy to collaborate with your team to help you generate more and better marketing contacts. How can we help you with your Lead Generation strategy?